Why do we have nightmares? What’s the point? Why would evolution shape a creature so pathetic as to suffer restless nights because its own subconscious concocts terrifying visions? 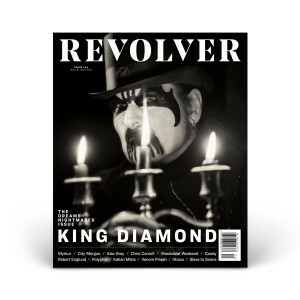 For over 35 years, occult-metal pioneer King Diamond has been bringing his bad dreams to life in his music … but then his “worst nightmare ever” came true. In this special issue we celebrate artists that embrace their dark visions on the path to creative illumination. Order today and please note the cover pictured is the issue you will receive. In addition, there is a limited edition King Diamond box set with three additional bonus covers that are only available via the box set!